The Burlingham Sports Starter Jump Course is a course for just about anyone. The Starter Jump Course includes 3 verticals and 2 oxers (5 jump set). 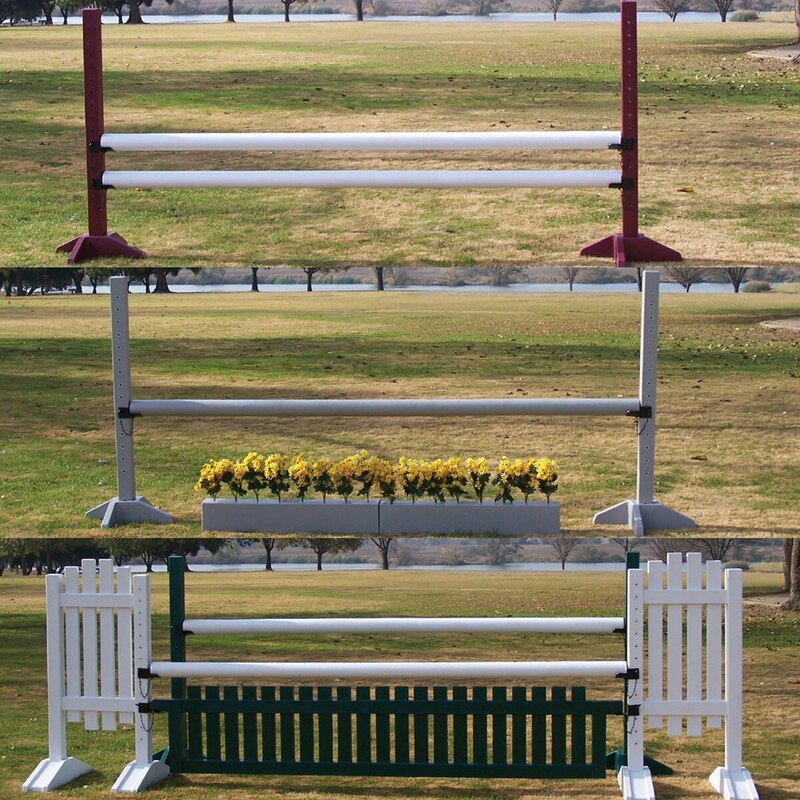 All standards are 5' and jump poles are 10' as pictured. Burlingham Sports Starter Jump Course is rated 4.0 out of 5 by 2. Rated 4 out of 5 by jackie123 from Overall Exelent, but could be about $900 cheaper. i bought this item and worked great! had it fo about a year... faded and kind of worn out but still in good working condition. goood for beginers in jumping and horses!! but could be cheeper by about $900 bcouse of fadding and weering... but overall exelent!!! Rated 4 out of 5 by JessR from Everyone at my farm loves these jumps I've had this jump set for almost a year now. I get allot of compliments - even from people seeing them for the first time. They are easy to move, and very light. It's easy to set jump heights as the standards are marked. It was a little bit of a pain to put the standards and the gates together, but we got past that. They are starting to show wear (a pole is busted, and some of the standards have warped from being left on their sides, and the flowers are fading from being in the sun). I chose this jump course set because even though it came with 5 jumps, the two oxers allow me to set up a course of 7 verticals if I choose. Even though they are pretty expensive, they are worth it due to high quality.